I had been dropped off at the Engen One Stop on the N7, the one on the turn-off to Klawer. Nigel, a technician working for Daimler-Chrysler had been nice enough to give me a ride up from Clanwilliam, where I’d spent the night, from a day’s hike from Vredenburg the day before. I used the facilities. It was hot. Very hot. 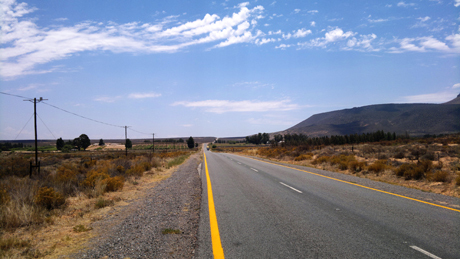 Mid-summer in the far northern Cape, only around 400 k’s from Namibia, and not far from the escarpment either. I was on my way to Kimberley, on a schedule, and decided to take a walk. The land was long, featureless, brown, low hills, heat. I walked slowly and calmly, trying to minimise the sweat. Slowly the garage drifted back behind, growing smaller as I climbed a lonely hill then disappearing on the next descent. I was alone, just me and the highway, not even a farmers fence running alongside. Cars passed, I hiked, nothing bit, I kept walking. I drank water. I started to wonder if it had been wise to leave the garage. The heat was climbing, at least 32 at nine in the morning. I started to wonder, would anyone stop? A double cab bakkie came zinging past at a hectic pace, at least 150km per hour. I watched it go, wondering what that guy inside it must be like when, bam, it was stopping, stopped, then reversing just as fast, chewing up the gravel. I ran for it, reaching it then jumping inside, swinging my backpack in, caught up in the guy’s speed, trying to work with him. Door closed and we charged off. The aircon inside was good and solid, I was happy to be out of the sun. We sat in silence for a while. I looked at my new guy. He was thickset, strong-looking, a farmer around the age of thirty-five perhaps, born and bred around these parts, balding on the top. The silence stretched out. I asked him a question. Maybe I said thanks for picking me up. He smiled and nodded. I asked him where he was going. He began to answer, and I realised, right then, that we had a problem. This guy stuttered, a strong, strong stutter. Panic seized me, gripping me about the chest and up under my arms. He was still trying to get the word out. He’d get close to a second syllable, so close, but then abandon and start again, caught in an incredible effort. I wasn’t sure what to do, I didn’t want to be rude, the space between us was so small. ‘Vanrhynsdorp?’ I asked suddenly, then realised I shouldn’t do that, perhaps I’d put my foot in it. He gave me a huge smile, pointing a happy finger at me. I tried to stay calm, to pretend I wasn’t pretending, but soon I didn’t have to. This guy sucked my anxiety away, because he would have none of it. He just spoke, he was happy to speak, it didn’t matter how long it took. He doesn’t keep quiet for nobody. 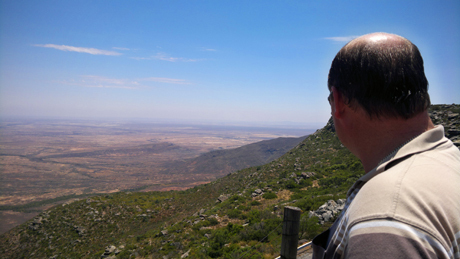 By this time it’s not far to Vanrhynsdorp, where I’d need to turn off, and he tells me there’s a chance he needs to go to Niewoudtville, the first town on my route inland, a tiny place perched on the rim of the escarpment. He’s just got to check something, he says, and perhaps he’ll pick me up in half an hour. We sit in silence a moment. I ask him if he’s seen the movie The King’s Speech. He says he hasn’t. I tell him it’s about the King of England, during the second world war, where because he was the king he had to make speeches, huge speeches, to the entire world over the radio. I say that this is a problem because the King stutters, he stutters bad. My friend is all ears. I tell him about Geoffrey Rush, the unorthodox speech therapist, how he gets him to try swearing to help him speak, but now that I’m talking I’m getting nervous, so I can’t find the Afrikaans word for swear, so I’m groping for the word like he does, trying to find it. He gets it, and goes off like a bomb. And it’s incredible, over the roar of the concertina and the rain of banjo my man is talking absolutely perfectly. Soon it’s all over, it’s time to drop me off. I tell him my name, he tries to tell me his. He tries, and tries, and tries. Then he shakes his head, huge smiles, and pulls out a business card. Marius. I see it’s Marius. He tells me he’ll be back in half an hour, I should just wait. But if I get another lift, then I must come and stay at his place in Niewoudtville sometime. He’s a champion guy, champion. He speeds off in the heat. At three o’clock the next morning I’m back in Vanrhynsdorp. What happened was after Marius left me things took a depressing turn. I stood outside Niewoudtville for ten hours, watching the cars and the trucks motor by. No one wanted anything to do with me, the sky changed, it got dark, and cold, and I changed clothes on the side of the road. Eventually I caved and decided I’d show some cash and go back to the truck stop at Vanrhynsdorp and there organise a lift straight. It was that or nothing, the cricket was slipping away. At the town I scored immediately. A huge sixteen wheeler with a double trailer was filling up. I climbed up the cab and knocked on the window and a tired, tired, tired man opened up for me. I asked him if he could take me to Kimberley and if I could only pay him sixty, because that’s all I had for the trip. Sleepily, wearily, he said he could, but he’d have to sleep first. It was ten then, he said with his sleepy smile, we’d leave at midnight? I said cool. Now I was walking along the side of his long, parked, metal beast and it was far past twelve. I’d spend the night watching the truck, once the hour passed, not wanting to take my eye off it, not wanting to doze and miss it. I’d taken to sleeping underneath it, sure that if it started I’d wake too, but scared I wouldn’t, so sleeping for a few seconds only, and finally I’d decided that the window for making the cricket had passed, and I may as well wait for morning and go some other way, maybe to the sea. I’d given up, was taking a last walk around the lorry, for no reason really, when I heard a whistle. It was on. ‘Come round to the other side,’ he called down, the truck juddering then roaring to life among the sleeping others. I did, head full of rising adventure blood, climbing up high to the cab. Inside my man was still sleepy, still with his swollen eyes. We crawl out of the sleeping town, slowly moving through the massive gears. He says it should take around 11 hours to Kimberley, we’ll be there by noon. I look over at him. He’s staring ahead, slumped on the wheel, waking up. He has an incredible under bite, a piece of lip sticking way out from a strong, handsome face. He sits stocky in that chair, over that wheel, like he’s spent many days, weeks and months. There’s a hotplate and a pot between us, obviously he likes to cook a meal every now and then, and before we left he put on a new, clean, crisply ironed tee-shirt, taking it out of a carefully packed suitcase. Who is he? I wonder. What is he going to tell me? We barrel off into the darkness, the escarpment and Van Rhyns Pass ahead. It’s three in the morning. Four days later I returned home. I peeled my hitching clothes off me, washed, dressed, shaved, and got back to real life. In amongst the normal, the getting it all done, I thought back on the hitch. I made the cricket and it was great. A carnival in the middle of dusty, brown Kimberley. Neon green with bright lights and bright people and braai smoke drifting high. Alviro Peterson manned the boundary right in front of me. He’s smaller than I thought. The crowd kept messing with him. We didn’t win. It doesn’t matter. It’s one memory, in a wheel of others.